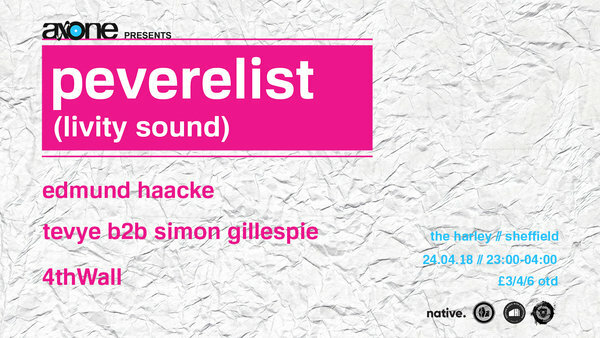 For our 4th party, we're delighted to be welcoming Bristol lynchpin, and Livity Sound head Peverelist! Releasing bona fide classics early on, such as his own 'Roll With the Punches' and RSD's 'Pretty Bright Light', Punch Drunk has always had the vision to give many local artists their first release, often to international critical acclaim, including Kahn, Ekoplekz, RSD and Guido, as well as Peverelist himself. The label continues to this day to have a pure underground attitude to pushing new music from his adopted home town. After releasing his own debut critically acclaimed 12" singles on Punch Drunk, his own style led the zeitgeist of the second generation UK dubstep sound and he began to carve his own niche, in his own inimitable style, releasing further 12"s on Skull Disco & Tectonic widely regarded as classics of the genre. Pev followed this up with his unparalleled debut album 'Jarvik Mindstate' on Punch Drunk in 2009. and has since dj-ed worldwide, spinning his eclectic mix of techno and UK Sound System music. He had produced countless remixes along the way for the likes of Shed and Honest Jons, and has worked closely with Hessle Audio, releasing two 12"s with the label, 'Dance til the Police Come' and 'Raw Code' (co-produced by Kowton) and also contributing a track to their definitive '116 and Rising' compilation in 2011. Meanwhile, as the wider UK scene was losing direction, Pev refocused his efforts and formed the Livity Sound label and collective alongside fellow Bristol based artists Kowton and Asusu, with the aim to pursue their shared ambitions and musical vision. The label released a series of 12" vinyl only releases, both solo and collaborative efforts, to critical acclaim, as documented in an extended Wire Magazine cover feature. Autumn 2013 saw the release of a self titled double CD compilation bringing all of these tracks together in a digital format for the first time, resulting Resident Advisor's prized accolade of Label of the Year 2013. 2014 saw the label invite some of their favourite artists to reinterpret some of the tracks from the compilation. This project resulted in a series of stunning re-workings of the original material from the likes of Surgeon, 2562, Kassem Mosse & Mix Mup and Tessela to name a few. ​During this time, the Livity Sound trio developed and toured a formidable collaborative live show performing at clubs and festivals across Europe and Japan bringing a new energy to the material, whilst maintaining a perpetually hectic dj schedule. Pev finished the year with a surprise mini LP '12,000 seconds' for London based tape label Magic and Dreams, venturing to the outer limits of his inimitable sound, a taster for highly anticipated new material set for release on Livity Sound through 2015. Support from Edmund Haacke, Tevye, Simon Gillespie and 4thWall.